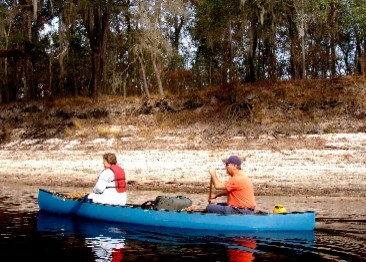 Live Oak, FL--Fourteen persons and a dog got together at the Spirit of The Suwannee Music Park Boat ramp on November 28, 2008 for a fourteen-mile down the Suwannee. The weather prediction called for a fifty to seventy percent chance of rain but the Fell ow Travelers would not let a little rain threat cancel the trip. John Williams was first to arrive and Jeanne Hewetson was not far behind. Diane, Charlie, and Ellen Stines arrived a little ahead of time. It was only a short time before Roy, Eric, and David Moye came. Keith, Audrey, Ray Dean, and Karen Webb all came down from western North Carolina and were ready to launch. Even Art and Janice Shelfer were not late. Jeanne received her Fellow Traveler shirt after racking up enough points and she really flattered the shirt. After the canoes were taken off the trailers and vehicles the drivers took the cars to the agricultural inspection just across the road from Gibson Park. John and Charlie ferried most of the gear to the Holton Creek camp and left it in the Expedition and on the trailer just outside the gate. After that they rode John’s Suburban back to the agricultural inspection station to meet the other drivers. Donna Ellis could not make the trip because her Arabian gelding forgot he was a gelding and hurt Donna’s shoulder trying to court a mare, but Donna did meet the drivers and carried them back to the put -in so that no shuttle would be necessary on Saturday. Once the drivers were back it was time to launch. By about 10:30 seven canoes were headed downstream. Keith and Ray Dean brought their wives so Karen and Audrey were the only rookies on the trip. Keith and Audrey rode Keith’s pretty blue Discovery 158, Ray Dean and Karen took the battle-scarred Gunn Boat and carried Duke the Jack Russell, John and Jeanne paddled John’s Mad River, Roy and Eric rode Roy’s red k evlar Mohawk, David soloed the white Mohawk, Art and Janice used the Canadienne and promised not to let it float away this trip, and Diane, Ellen, and Charlie teamed up in the red Penobscot 16. 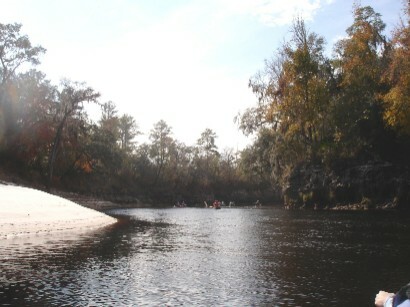 The Suwannee between Suwannee Springs and Gibson Park is a very pretty section with many high limestone banks and lots of nice sandbars. The low water levels made the sandbars more prominent than usual. North Florida is not famous for autumn colors but this trip saw the peak for what it does have to offer. The bald cypresses were orange brown, the maples and oaks varied from brilliant reds to subtle yellows, and other hardwoods presented a pretty palette. Despite the weather predicitions of rain, the sky remained baby blue and the clouds were white and fluffy. It was plenty warm but certainly not hot. The weather was near perfect for the entire paddle. No one experienced any difficulty in keeping up with the leisurely pace. Karen and Audrey seemed to enjoy the scenery if not the company. This was the first trip Ellen had made in several years but she elected to come south from Manhattan for this trip even though it meant foregoing Christmas. It was a special trip to have her along. She helped Charlie paddle and allowed Diane just to sit in the middle of the canoe without lifting a paddle. 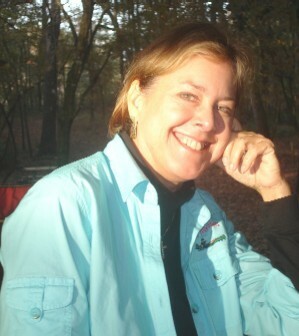 Usually Diane sits in the front of the canoe without lifting a paddle. The paddlers reached the landing at the Boys Ranch about 12:30 and took a long lunch break. No one had exotic treats to share but everyone had enough. Diane had bought some oranges which looked liked tangerines, peeled like oranges, and tasted like lemons. After lunch the float resumed. 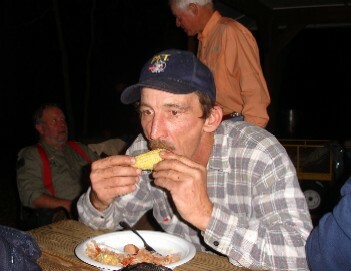 Ray Dean was surprised about how little wildlife was seen. There were a few hawks, some vultures, and some woodpeckers but very few wading birds and no ducks. There was evidence of otter and beaver but the animals did not appear. A few turtles were seen sunning on the logs. It was a trip with no alligator sightings. The canoes reached the landing at the Holton Creek River camp about 1:45. There was very little gear in the canoes but it was carried to the camp. Everyone chose a shelter or place to pitch a tent and then helped carry the equipment from the Expedition to the campsite. It was not a long carry. The rules allow a car to be brought to the gate but not brough inside the c amp and the car can not remain overnight. After lots of fun conversation it was time to prepare supper. The King made the best shrimp boil ever and the Boss (Diane) made coleslaw. Every last onion and potato of the low country boil was consumed. John baked his pineapple upside-down cake in the Dutch oven and Keith cooked a Black Forest cake in another Dutch oven. Edwin and Carolyn McCook came for supper as did Jerry and Donna Ellis. Once the food was eaten a few stories were shared. Then the McCooks and the Ellises went home to comfortable homes. Edwin drove the Expedition to the agricultural inspection station. The campers then sat around the campfire until bedtime. Ray Dean entertained the group by demonstrating how protective of Karen a Jack Russell can be. However he fell short on his story-telling attempts to relate the stories about Sasquatch and about W.H. killing the bull. Calvin had told the stories on the Boundary Waters trip and kept everyone in stitches but Ray Dean’s versions were sort of the Reader’s Digest condensed versions. It was a great night for sleeping. Bugs were not a problem an the temperature was conducive to good shut-eye. Charlie was the first one up on Saturday morning. He made forty cups of coffee and cooked grits and sausage. Due to numerous complaints about Charlie’s grey and brown eggs Roy volunteered to cook yellow ones. John and Art cooked pretty good biscuits in the Dutch ovens. After breakfast the tents were taken down and all the gear stored in the shelter closest to the gate. Very little gear was taken to the canoes. The Saturday voyage was underway befor ten. The weather remained good but it did look a little threatening as the flotilla approached Gibson Park. 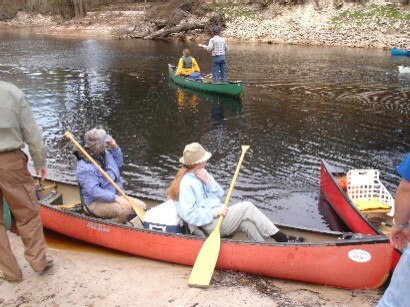 Most of the paddlers elected to do the strenuous paddle up the Alapaha Rise spring run. It was a good paddle but the spring was not really clear. After that it was take-out time. Doug Carter, the former host at Holton Creek, was the new host at Gibson Park and seemed pleased to encounter the Fellow Travelers again. 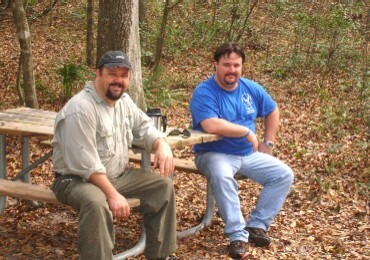 Art and Charlie drove to the campsite to pick up the gear while everyone else waited at the park. Jeanne and John left immediately. Once the equipment was brought back the trailers and vehicles were loaded and all left. Within thirty minutes of departure the clouds opened and it began pouring rain. It was a really pleasant trip.